I read this article and found it very interesting, thought it might be something for you. The article is called As India Ages, Dementia Threat Looms and is located at https://archive.indiaspend.com/sectors/as-india-ages-dementia-threat-looms-54141. India is a youthful country, for now. According to the Census of India, the population of the country below 35 years of age is 51.8%. By 2020, India is projected to become the youngest country in the world, with a median age of 29 years. But, as this population advances into old age, India will face a demographic transition. The same numbers, or more, that make up the country’s youth bulge will constitute the aging population over the next four decades. In a rapidly graying world, will India be prepared to deal with the challenges of an aging population? A number of developed countries, while they were still young economies, had implemented policies to care for their elderly. That investment in preparing for the demographic transition has helped maintain the economic and social well-being of their older citizens. Given the changing nature of Indian family structures, from joint families to nuclear, and severely lim­ited old-age income support, the health care challenges posed by the aging population in India are likely to be greater. Data suggest that the aging of India’s population will lead to increases in the preva­lence of chronic conditions associated with age. One such fatal chronic condition that is particularly prevalent among people over the age of 60 is dementia. Dementia is projected to become an epidemic among the elderly in the coming decades, according to the World Health Organisation. The World Alzheimer Report 2012 estimates that the number of people with dementia above the age of 60 years in India will touch 4.4 million by 2015; the current figure is 3.7 million. Moreover, the proportion of people with early-onset dementia in India is high (49.9%), as compared to that (7%-30%) in developed countries. Among the nations in the Asia-Pacific region, only Australia, Japan, and Korea have instituted public-health policies directly addressing the looming burden of dementia. China and India are only just trying to get dementia on the health-policy agenda. 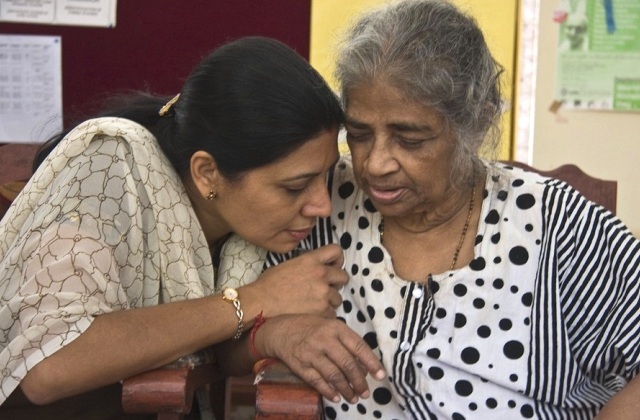 In many parts of the world, including India, the symptoms of dementia (forgetfulness, impairment of daily activities, etc) are considered a normal part of the aging process. Researchers now have a better understanding of these cognitive deficits associated with aging. Dementia is a group of symptoms characterised by progressive memory loss and deterioration of other mental faculties such as language, judgment, and deficiency in social interaction. It is caused by progressive brain cell death, but may also be caused by head injury, stroke, or brain tumor. The more common form of dementia is Alzheimer’s disease (AD). AD is believed to be caused by “plaque” (a build-up of beta-amyloid protein) between the dying cells in the brain and “tangles” (caused by disintegration of tau proteins) within the cells. The brain tissue in a person with AD has progressively fewer nerve cells and connections. The diseased brain gradually shrinks in size. The bad news is that there is no cure for dementia as yet. The better news is that prevention, or in this case, delay of onset, can still be achieved through awareness and focus on the modifiable risk factors—hypertension, diabetes, obesity, stress, and sedentary lifestyle. Diabetes and obesity are two risk factors implicated in cognitive dysfunction and dementia in later life. According to the International Diabetes Federation, diabetes affects at least 285 million people worldwide, and that number is expected to reach 438 million by 2030. Asia accounts for 60% of the world’s diabetic population. The major driver of the diabetic epidemic is obesity, which in turn is primarily driven by rapid urbanisation, nutrition transition, and increasingly sedentary lifestyles. Although the rates of obesity in many Asian countries are lower than those in the West, there is a tendency toward greater abdominal or central obesity and less muscle mass among Asians, resulting in an increased tendency for insulin resistance. This “metabolically obese” phenotype among normal-weight individuals may explain the increased predisposition for diabetes in Asia. Obesity is associated with a two-fold increased risk of dementia. The risk of dementia increases by approximately 50% in people with type 2 diabetes. Patients with diabetes mellitus are more likely to present earlier brain atrophy. Several studies have attempted to identify type 2 diabetes related neurological changes using magnetic resonance imaging (MRI). One such study involved the use of MRI to identify the regional distribution of brain atrophy and to assess if atrophy may mediate the link between type 2 diabetes and impaired cognition. Findings showed that there indeed was greater loss of gray, white, and hippocampal matter in patients with type 2 diabetes than in those without. And that the cortical atrophy patterns seen in patients with type 2 diabetes resemble those seen in preclinical AD. Many studies suggest that the risk of brain degeneration increases not only in the case of patients with diabetes, but also in people with pre-diabetes. Individuals with pre-diabetes are those with impaired fasting glucose and/or impaired glucose tolerance. Since there is no known cure for dementia, we must aim for better preventive interventions to lower the disease incidence or slow its progression. Better weight management can afford better protection to the brain, in addition to myriad other health benefits. There is also consistent evidence from several studies that physical exercise and cognitively stimulating activities in early and mid-life have a role to play in delaying the onset of dementia. The best way forward is to take early action to prevent disease progression at an individual level and undertake measures at a societal level that includes policy making, planning, and allocation of health and welfare resources toward dementia care.